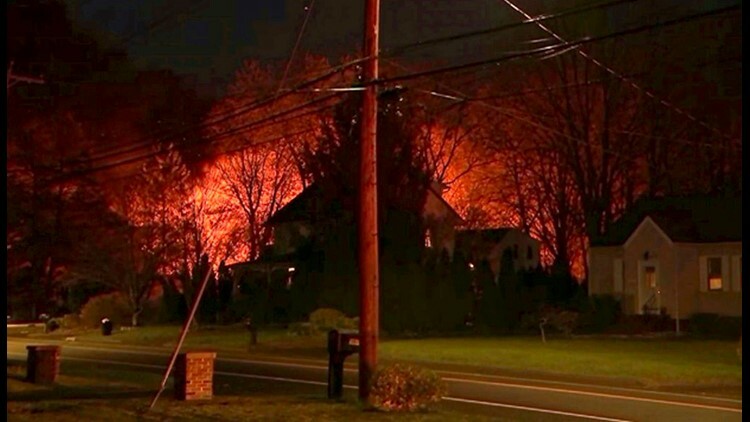 NORTH HAVEN, Conn. (AP) — A Connecticut woman's call to police to report domestic violence led to a standoff and explosion in a barn behind her home that left one person dead and nine officers injured, officials said Thursday. Grant said she couldn't confirm the identity of the body until an autopsy was completed. The woman was not at the home when police arrived Wednesday night, but Grant declined to release her condition, saying it was part of the investigation. Deborah Sayre filed for divorce on April 18 and checked a box for a line that said the marriage had "broken down irretrievably." She did not immediately return a phone message Thursday. "Come out, John," police said into a bullhorn aimed at the house before the explosion. "They all did suffer injuries that were consistent with the blast," Mulhern said. "This impacted not only the North Haven Police Department, not only our community, but this is a far reaching incident to the other communities that serve the south central region." "Then we heard all the, oh my God, all the ambulances and fire engines. The noise from all the emergency vehicles was unbelievable," she said. "It's a shock. Nothing ever happens like this in North Haven."